Home/Animals and Sound/Importance of Sound/Why is sound important to marine animals? In addition to vision, marine animals use other mechanisms, such as sound, to gather information and communicate. 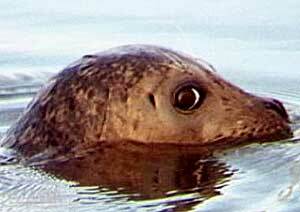 Photo of harbor seal courtesy of Sean A. Hayes, Salmon Ecology Group, NMFS. Hearing is the universal alerting sense in all vertebrates. Sound is so important because animals are able to hear events all around them, no matter where their attention is focused. Many species of blind amphibians, reptiles, fishes and mammals are known, but no naturally profoundly deaf vertebrate species have been discovered. Although hearing is important to all animals, the special qualities of the undersea world emphasize the use of sound. Sound travels far greater distances than light under water. Light travels only a few hundred meters in the ocean before it is absorbed or scattered. Even where light is available, it is more difficult to see as far under water as in air, limiting vision in the marine environment It is similar to looking through fog on land. So, the best opportunity for long-range vision underwater — especially in murky water — is to swim beneath objects and see their silhouettes. The undersea world presents very different conditions for hearing as well as seeing. Sound travels much farther underwater than in air. The sounds produced by many marine mammals can project for miles. Strong echoes are always present underwater, because sound travels without much loss and there are many underwater surfaces that reflect sound. So, it can be tricky to communicate using sound underwater, because a listener may have to sort through many different sounds and confusing echoes to hear the message. Marine mammal sounds are probably structured so that they can be recognized in spite of all the echoes. 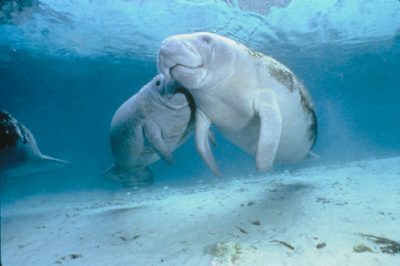 Touch is very important to marine mammals, such as these manatees. Photo courtesy of South Florida Water Management District, a regional state agency working to restore the Everglades, www.sfwmd.gov. Of the five senses (touch, taste, smell, sight, hearing), touch probably functions in the most similar way for animals on land and underwater. Touch is very important in close social interactions. For underwater animals, the sense of touch may also provide important information about water currents and the motions of nearby animals. The senses of taste and smell enable animals to detect chemical compounds; they serve very similar functions. The underwater environment presents very different opportunities for these senses. Chemical particles travel much more slowly in water than in air. Thus, except for very short range effects, it is likely that the sense of smell is largely used to detect the trail of chemicals left behind by a moving animal (or the “trail” created by stationary animal in a current), rather than the chemicals that drift away from a stationary animal. As the previous pages have shown, underwater sound allows marine animals to gather information and communicate at great distances and from all directions. The speed of sound determines the delay between when a sound is made and when it is heard. The speed of underwater sound is five times faster than sounds traveling in air. Sound travels much further underwater than in air. Thus marine animals can perceive sound coming from much further distances than terrestrial animals. Because the sound travels faster, they also receive the sounds after much shorter delays (for the same distance). It is no surprise that marine mammals have evolved many different uses for sounds. Marine animals rely on sound to acoustically sense their surroundings, communicate, locate food, and protect themselves underwater. Marine mammals, such as whales, use sound to identify objects such as food, obstacles, and other whales. By emitting clicks, or short pulses of sound, marine mammals can listen for echoes and detect prey items, or navigate around objects. This animal sense functions just like the sonar systems on navy ships. It is clear that producing and hearing sound is vital to marine mammal survival. Sound is also important to fishes. They produce various sounds, including grunts, croaks, clicks, and snaps, that are used to attract mates as well as ward off predators. For the oyster toadfish, sound production is very important in courtship rituals. Sound is produced by the male toadfish to attract the female for mating and is especially important in the murky waters that toadfish inhabit where sight is limited. Marine invertebrates also rely on sound for mating and protection. Little research has been done on marine invertebrates that produce sounds, but for those that do, like shrimp and lobsters, sound is very important for survival against predators. As you can see, sound is very important to its underwater inhabitants. Most marine animals rely on sound for survival and depend on their unique adaptations that enable them to communicate, locate food, and protect themselves underwater.